At Enrique Tomás we want to bring the best products to your table, that is why we offer you a high quality Iberian chorizo, destined to satisfy the most demanding palates. The chorizo is one of the standard sausages of the Spanish gastronomic culture, made from the finest quality lean pork parts and seasoned with paprika and spices, which gives it its characteristic colour and flavour. After a short curing period we can enjoy a unique sausage, essential in our kitchen. In our online shop you can enjoy sausage, acorn-fed Iberian and 100% Iberian sausage from Huelva, Salamanca, Cáceres - Badajoz and Córdoba. 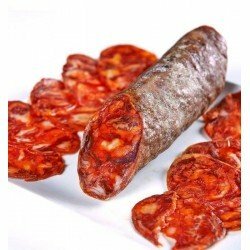 In addition, you can choose between the whole piece, half piece or ¼ format, cut portions by knife or sliced by machine and the delicious Iberian packs of acorn-fed 100%, the ideal gift for any lover of cured meats and sausages, as it contains 100% Iberian ham, sausage, pork loin and chorizo, the highest quality step, perfect to delight the senses and make you enjoy yourself to the full. At Enrique Tomás we can guarantee that all of our cured meats and sausages are of the highest quality, since we evaluate each part of the process in detail to ensure that the products that reach your table come from the best white and Iberian pigs and are perfectly cooked and cured, all with the aim of obtaining a homogenous and excellent flavour. 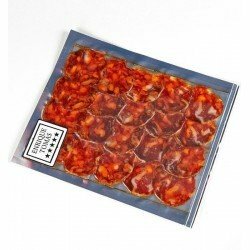 We have a wide range of Iberian and chorizo bellota, ideal for satisfying lovers of this dry sausage, with an intense and delicious flavour, characteristic of this product, which has made it a popular choice throughout the world. 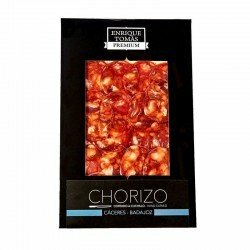 The chorizo Enrique Tomás is perfect to enjoy alone, accompanied by bread, on a cheese and sausage platter or to incorporate into your more traditional dishes and fill them with flavor, because if there is something certain it is that with this sausage you will never look bad. 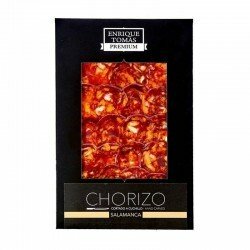 Choose from our wide range of products and make a safe and fast online purchase to enjoy the best chorizo directly at home and without complications. Perfectly vacuum-packed and ready to taste, a unique alternative for any occasion. Whether whole, sliced, cut with a knife or in packs, we guarantee that whatever you buy will always be delicious. 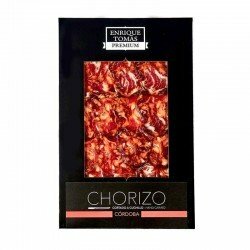 What are you waiting for to get the best chorizo with just one click?